Hi girls (and guys)! 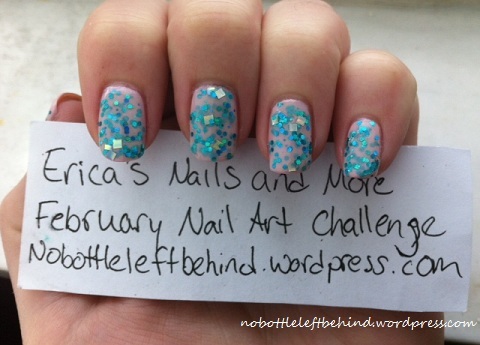 Welcome to day 3 of the nail art challenge. I was really looking forward to todays challenge because I wanted to try out a jelly sandwich. I’ve flipped back and forth between actually liking or not liking this nail art style. Currently I like it lol. I’m still trying to stick with using my untried polishes when I can. 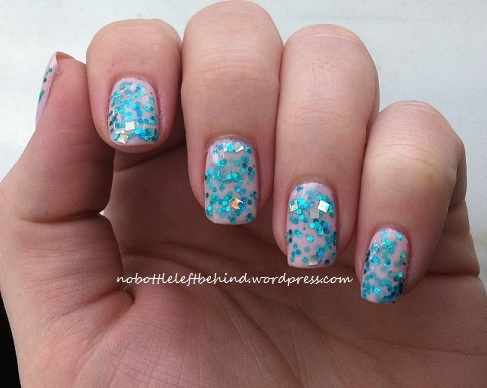 Today I have one of my untried polishes for you. 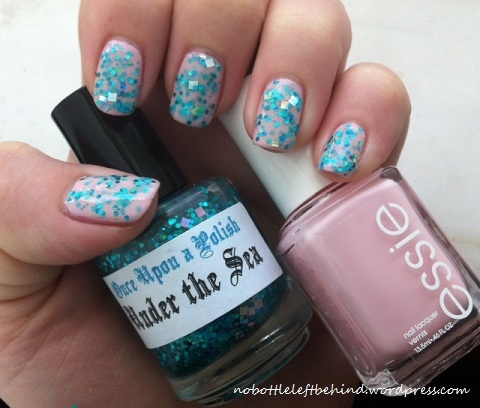 It’s also an indie from Once Upon a Polish called Under the Sea. Unfortunately, she’s no longer making polishes but I was lucky enough to grab this one before she closed up shop. I’m so glad I did because it’s beautiful! Under the Sea was described in her Etsy shop as “holographic blue hex glitters with holographic silver square glitters in a clear base.” It’s such a beautiful polish. I had to do some dabbing to get the glitter in place because it’s just so packed full of chunky glitter that it doesn’t spread so even. To create my jelly sandwich I started with 3 coats of Essie Muchi Muchi. This is one of my favorite Essies. It’s a sheer bubble gum pink color. 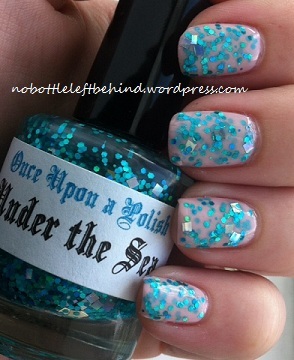 After the 3 coats of Muchi Muchi dried I layered one coat of Under the Sea. Then one more coat of Muchi Muchi and a final top coat of Under the Sea. Lot of layers of beautiful :). I’m really liking this combo. It almost reminds me of those big speckled gumballs. I want to give you all a quick reminder about the epic giveaway going on. It’s open until the 24th so if you haven’t entered yet then you still have time. You can find the details for it here. 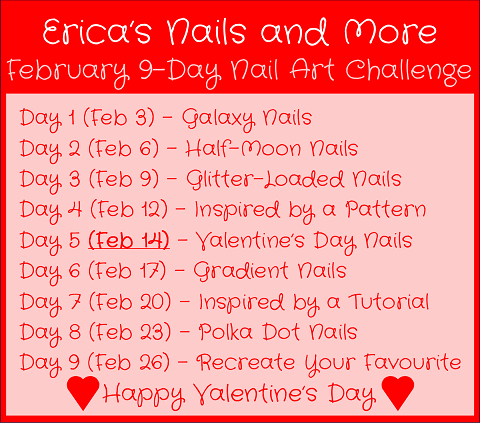 Don’t forget to check out the InLinkz below to see all the other Glitter Loaded manis for today’s challenge! Very pretty! It looks great on that light pink base! This is really pretty! Looks like we both had the same thought for Day 3 🙂 I love that pink, and if that polish is supposed to be referring to The Little Mermaid, I think I need it 😉 I love anything Disney, even if it isn’t made by Disney, lol! This is awesome! 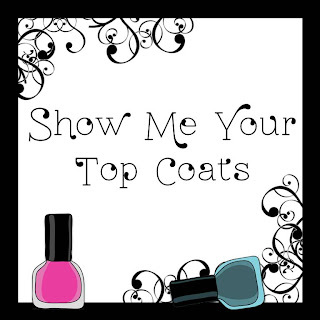 Become a Julep Maven today! Use promo code FREEMAVEN at check out for your free intro box!